Two professors are trying to prove that Turkey has a historical claim to 150 islets currently claimed by Greece. Within the context of its EU accession bid, Turkey is seeking resolutions on the Cyprus issue and Aegean maritime disputes. Two professors are trying to prove that Turkey has a historical claim to 150 islets currently claimed by Greece. Within the context of its EU accession bid, Turkey is seeking resolutions on the Cyprus issue and Aegean maritime disputes. Diplomatic sources indicate the Turkish and Greek sides are involved in intense talks, and two academics showed that a decision by the Permanent Court of Arbitration (PCA) legally supports Turkey's position concerning its disputes with Greece in the Aegean Sea. Unlike its previously held position, Greece will be reportedly reluctant to resort to the International Court of Justice (ICJ) for the settlement of long-standing disputes with Turkey as it now contends that the EU could play a constructive role between the parties. That being said, international lawyers Sertaç Hami Ba?eren and Ali Kurumahmut, political science professors at Ankara University, have recently published research on the disputed islands in the Aegean Sea. Ba?eren and Kurumahmut proved that the PCA's reference in its decision regarding a dispute over the islands, islets and reefs in the Red Sea to Article 16 of the Treaty of Lausanne provides a legal advantage for Turkey. In their book, based on international conventions and Ottoman archives, the two asserted that considering the PCA's decision in question, Greece has no jurisdiction over the 150 islands whose sovereignty still remains non-transferred. Ba?eren and Kurumahmut recall that a consensus between the parties is needed to determine the future of those islands. Once Greece's lack of jurisdiction is legally grounded, the entire Aegean map will require significant alterations, which they illustrated in their book. In such a case, Turkey will gain striking leverage in the long-standing bilateral disputes, including the issue of territorial waters. Given Greece's unilateral action to extend its territorial waters from six to 12 miles, the issue of non-transferred islands is an important one. The book examines the comment outlined in the decision of the PCA that settled a maritime dispute between Yemen and Eritrea by making a special reference to Article 16 of the Treaty of Lausanne. The authors subsequently conclude that the said decision treats the disputed islands as territories over which no certain jurisdiction was available. 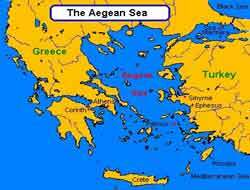 Departing from this conclusion, the authors further assert that international law clearly states Greece has no jurisdiction over the Aegean islands, islets and reefs. Paragraph 165 of the court's decision rules that "in 1923 Turkey renounced title to those islands over which it had sovereignty until then" on the condition that the future of the islands in question would be determined by the parties. Recalling that this provision does not apply to the Aegean islands, the authors allege that Greece is unable to claim sovereign title over the island territories. In their view, the islands are territories whose sovereignty was not denounced by the Ottoman Empire and for this reason they were transferred to Turkey as the heir of the empire. A partial list of islands over which the authors believe Greece can't claim sovereignty includes Gaidaros, Mandiraki, Farmakonisi, Pserimos, Adelfia, Plakhida, Sofrana, Astakidhapula, Kandhelioussa, Levita, Zenari-Kinaros, Liadi, Furni and Fimena. Ba?eren and Kurumahmut underline that except for the islands whose transfer was made in accordance with international or bilateral treaties, the undesignated ones in the Aegean Sea do not fall into any state's jurisdiction as outlined in the PCA's Eritrea vs. Yemen arbitration ruling. The new argument based on recent scholarly inquiry suggests that inclination to resolve the Aegean maritime disputes within the EU context is not healthy, as the said disputes concern international legal rules and could be settled through the rights and obligations under the respective rules and provisions of public international law. Therefore, this approach implies that Turkey should resort to its entitlements under international law rather than political means to resolve the disputes in the Aegean Sea. Dr. Erdem Denk, also a political science professor at Ankara University, said Greece should be convinced that there are disputes other than the rift over the continental shelf. Noting that the Aegean disputes could be resolved through a mutually agreed approach that allows give and take, Denk recalls that the settlement of the disputes should start with determining naval authority areas, which will depend on to whom the islands, islets and reefs belong. Denk said the dispute is a fairly recent one, adding that only by determining the legal status of the disputed islets will there be further action toward a comprehensive resolution of the rift between Turkey and Greece. He noted that the parties have been holding secret negotiations and meetings to resolve the disputes, drawing attention to the Greek media's coverage on the deadlock in the Aegean maritime disputes. Following the EU's Helsinki summit, Greece and the Aegean disputes have acquired a special place and attention in Turkish foreign policy, which has become more focused on fulfilling its long-standing goal of Westernization. The EU has for some time served as the indirect mediator and facilitator in the disputes between the parties. Even though it seems uncertain what this tripartite relationship will bring in the near future, Turkey should be more demanding in regards to Greece. Recalling that the Turkish population in the Aegean region alone is twice as large as Greece's population, Professor Bayram Öztürk underlines that Greeks should understand the Aegean Sea is not exclusively a Greek lake. Although the Aegean Sea has been generous to both Turkey and Greece, the latter has acquired extensive benefits from this generosity. Given Turkey's dependence on the Aegean Sea through food security and the fertility of the islands' adjacent waters, it is clear Turkey should pay attention to the resolution of the disputed islands and islets issue. In the region, there are other risks in addition to the jurisdictional issues. For instance, 100,000 tons of Russian and the Caspian oil is sent to world markets through the Marmara and Aegean seas. Any major accident near the islets and islands would likely destroy them, resulting in enormous financial losses associated with tourism, fishing and other activities. Öztürk said that obtaining 5-6 percent of the Aegean Sea, which essentially includes the disputed island territories, would earn Turkey new economic resources. Describing Turkey's foreign policy regarding Greece as excessively romantic, Öztürk draws attention to Greece's continuous expansion since its foundation. Retired Adm. Çetinkaya Apatay notes that the Eritrea vs. Yemen decision may reveal the justification of Turkey's assertions with regard to the islands. He said the legal verdict implies that the parties to the dispute should get around the negotiation table for a comprehensive resolution. Apatay also recalls that in a NATO meeting where an imminent dispute between Turkey and Greece was discussed, a young military officer asserted that Gauda island belonged to Turkey. Apatay believes that a mutually constructive approach toward the issue rather than resorting to the binding rules by the ICJ should be the basis for a viable resolution. Some believe that the PCA's Yemen vs. Eritrea ruling will most likely exacerbate the deadlock in the Aegean Sea. Turkey's former Ambassador to Athens Tuncer Topur said if Turkey claims sovereign right to these islands, there will be a strong reaction from Europe. In an effort to make social life in the islands more attractive and entertaining, Greece has been investing heavily in the Aegean islands and islets. Financial incentives have been released to promote more inhabitants on these islands. Despite the enormous financial expenses involved, the Greek government has spared no expense in keeping the islands inhabited.